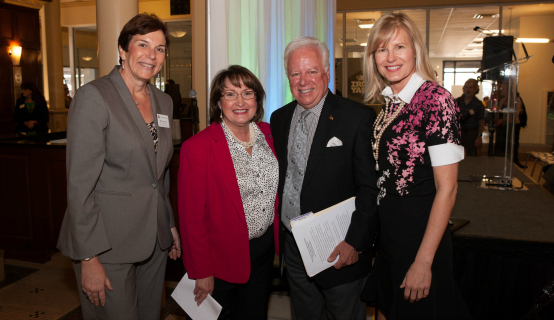 Orange County Mayor Teresa Jacobs recently joined community leaders and elected officials to launch a new resource center for Central Florida’s women entrepreneurs, the Women’s Business Center at Canvs, Orlando’s digital co-working space. Mayor Jacobs spoke at the event and was joined by Orlando Mayor Buddy Dyer, Florida Institute of Technology (FIT) President and CEO Anthony J. Catanese and the Center’s new director, Shea Glenny. Florida Tech will operate the center at the Church Street Exchange Building so that women entrepreneurs can align their new ideas with the region’s key emerging industries. The Women’s Business Center will focus on providing women access to capital, leveraging technology for innovation and growth, developing business models and plans, and navigating the entrepreneurial system. Funded in part by a $750,000 U.S. Small Business Administration grant, the Center will be strategically located with other tech companies in downtown Orlando’s Exchange Building to serve Orange, Lake, Osceola, Volusia and Seminole counties. The Women’s Business Center is located within the office of high-tech company Echo Interaction Group, which has developed more than 70 mobile applications for organizations varying from startups and entrepreneurs to Fortune 500 companies and the federal government. Echo’s CEO and founder Carlos Carbonell is part of Orange County’s Technology and Social Media Workgroup, which works to advance citizen engagement while supporting the digital community. Center Director Shea Glenny is known in the community for launching and hosting Orlando’s first city-wide celebration of Global Entrepreneurship Week through a series of workshops called the BIG Exchange. “I want to leave a legacy of three core values for our Center: producing premium thought-leadership content; being an authoritative voice on the dialogue about women in entrepreneurship and tech; and laying the cornerstone for a women-managed investment fund specifically for woman-owned startups,” Glenny said. A collection of photos documenting the opening of the Women’s Business Center are available for use by the media and are located on Flickr.